LinkedIn as we all know, is a more buttoned-up version of social networks. 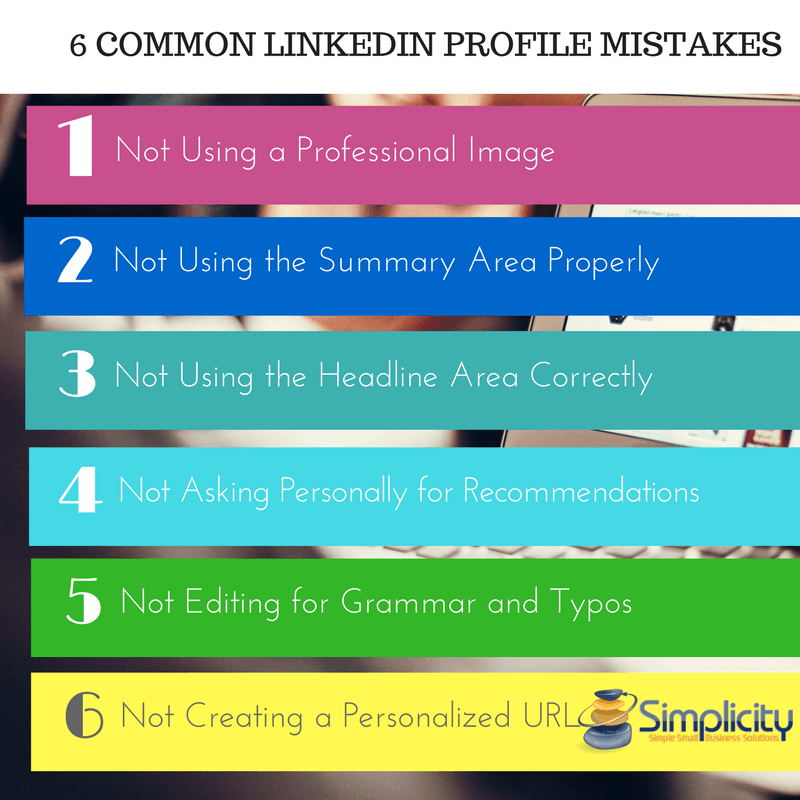 So the most common LinkedIn Profile mistake is to add a non-professional picture. You don’t want to put an image of you with your children, or a picture of your cat or dogs. Leave that for Facebook. Use LinkedIn to get professional connections by presenting a professional image to the world. To use the summary area properly, use good grammar, punctuation and symbols to separate the information you provide. Reading on a computer screen is difficult and requires a lot of white space and separation. The summary is a great area to explain either what you do, or what you want to do. On the summary, 3 lines is not enough! You have 2000 characters available, use them! You can use the pipe symbol “|” to separate words within the headline. You want to have recommendations that show up on your profile, but do not make the mistake of connecting to everyone and sending a mass message asking for recommendations. Take the time to personally invite each person to provide you a recommendation by reminding them of your skills and what you did for them. Read ‘How do I ask for a recommendation on LinkedIn‘. The worst thing that can happen is to have a profile that has a lot of poor grammar and typos. Have someone else look at your profile to notice any imperfections. LinkedIn provides a link that is just a few random letters and numbers. It’s important that you personalize it with your name. If your name is not available, play with variations for example sarah_santacroce or sarah.santacroce. Using your LinkedIn profile to attract potential connections, get more clients, or find a new job will work if you take it seriously, fill it out completely, use professional language, the right keywords and stay focused on what you want to do. If you need help filling it out, check out my LinkedIn Profile Quick Fix, a shorty but highly effective video course that turns your LinkedIn Profile into a client magnet. Sarah is an internationally recognized LinkedIn Specialist & Online Presence Mentor who has personally coached, mentored and guided over 1,900 entrepreneurs. She helps them position themselves as experts on LinkedIn, shows them how to find & express their unique voice & stand out as thought leaders. As a result they find their tribe, get the recognition they deserve & a steady flow of clients – with ease & not sleaze. In addition to her LinkedIn expertise, Sarah is known for helping fellow introverts market their business authentically & anxiety-free, sell their services & make a difference. She’s also the host of the ‘Introvert Biz Growth’ podcast where she has conversations with introverts who have grown their business using their introverted super powers. She lives in beautiful Switzerland where she was born and raised, but considers herself an alternative thinking citizen of this world who’s on a mission to bring more kindness to business. When she’s not working she loves adventure & traveling (ask her about her alter ego in Sicily), yoga & nature walks or hanging out with her 3 boys (a husband and two teenage sons). At the end of your post in the Take Action section. Using your LinkedIn profile to attract potential connections, get more clients, or find a new *** ??? *** will work if you take it seriously, fill it out completely, use professional language, the right keywords and stay focused on what you want to do. If you need help filling it out, check out my LinkedIn Profile Quick Fix, a shorty but highly effective video course that turns your LinkedIn Profile into a client magnet.